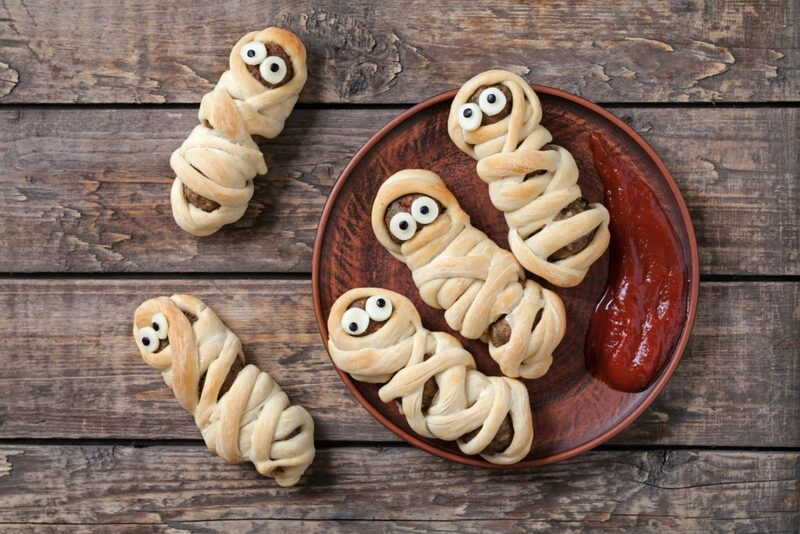 Whether you want to make it with sausages, hot dogs, or meatballs, these mummies are sure to be a hit! If you love finding recipes that have few ingredients and are super easy to make, like I do, then this one is right up your alley! All it requires is your choice of meat, pizza dough, and your favorite dipping sauce and you’re pretty much golden. If you choose meatballs, all you need to do it strand some spaghetti sticks or bamboo skewers through 3 of them to keep them secure. After you’ve wrapped your dough around them and placed them on your cooking sheet, you can carefully remove the sticks. Step 1: If your Meatballs are frozen, make sure they are all thawed before preparing. Carefully skewer three of them together. Step 2: Cut your pizza dough into thin strips (about 1/4'') and wrap your meatballs by criss-crossing to your mummy liking. Make sure to leave a space at the top for the eyes though! 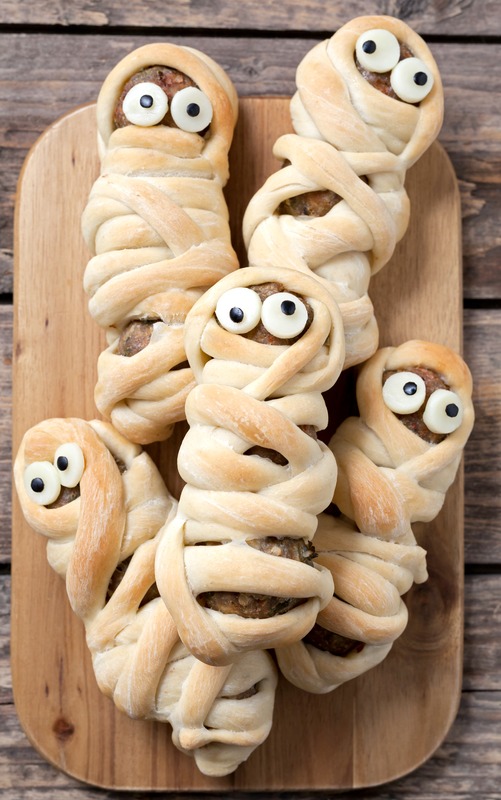 Step 3: Line a baking sheet with parchment paper, place your mummies on it, and carefully remove your skewers. Bake at 350 degrees for 17-22 minutes or until crust is golden brown and your meat is heated all the way through. Step 4: Poke through your mozzarella cheese with a straw and "glue" on your eyeballs with ketchup. *serve with warm marinara sauce or ketchup.